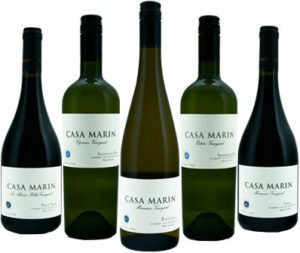 Casa Marin is, according to marketing manager and daughter-in-law of the founder, Jamie Verbraak, “The crazy story of a crazy woman.” María Luz Marín is the crazy woman in question who dreamed of starting a winery but had no money to do so. She represents the first generation of female winemakers to graduate in Chile, but whilst working for other wineries she started to plan, and more specifically, work out how she could raise the money to one day start her own estate winery. The answer was to become a bulk wine aggregator and broker, sourcing and selling huge volumes of Chilean wine to UK and other distributors. María Luz (shown right with winemaker son Felipe) built her business to become the third largest broker in Chile, which gave her the opportunity to kick-start her winery dream. Wishing to spread the risk a little, she looked for investors, but no one was willing to take that risk, especially in the site she had chosen in Lo Abarca sub-region of coastal San Antonio. It was widely considered as too cold, lying just 4km from the cool influence of the Antartic’s Humbolt Current, an area prone to fogs and frosts which has never recorded a summer temperature above 27°C. There was also the investment cost of bringing water to this area, around four times higher than doing so in the Central Valley vineyards. But the biggest stumbling block was María Luz’s gender in conservative Chile: she remains the only female winery owner in the country. Finally María Luz Marín struck out on her own, establishing Casa Marín in 2000, with their first commercial wine release in 2003. For the past nine years it is María Luz’s son, Felipe, who has been winemaker, assisted by his wife Jamie, but it remains a family affair with his mother still very much involved, plus brother Nicolas, father Andrés and aunt Patricia holding the key posts in the business. Felipe presented his wines on a recent visit to the UK where he explained that their Lo Abarca site has its own micro climate, tucked behind a hill that shelters it from the ocean, which means even with their coastal location they see frost on winter nights. From the top of the vineyard they can see the ocean, and here it is warmer with no frost, so it is a complex patchwork of vineyards that are so unlike the contiguous blocks of the Central Valley; their lowest lying vineyards see deep frosts on several nights per year. This tasting was of the estate’s top wines, though they have the more affordable Lo Abarca and Cartagena labels too. The wines are all interesting and all very good, truly among the standard bearers that could change perceptions of what Chile does, and what it is capable of. (2016) Felipe says the Riesling produces very small bunches and a low production, and he makes the wine without skin contact to retain purity. Pale colour, fresh clear aromas of lemon blossom, chalk and salt, some fresh red apple skins. The fruit has lots of Mandarin orange brightness and it is dry with a terrific core of waxy lemony acidity. Long and beautifly balanced, there's a hint of sweetness right in the finish (just 4g/l residual sugar). (2016) The flagship wine, from a very specific block on white chalk soil that is free draining and friable. Lovely flinty minerality joining passion fruit and subtle tropical fruit, but there's a sense of grip and depth too and a touch of green bean character. A very small proportion is barrel fermented which aids the textural feel in the mouth, the vegetal, asparagus flavour but ripe too and dry, with good acidity showing a little saline touch. (2016) Half of this blend was fermented in barrel with wild yeasts. Felipe describes it as a very low yielding variety that they harvest several weeks after the Sauvignon Blanc. Has a fair bit of green bean and asparagus character, but typically for Gris it has a slightly earthy, less exuberantly fruity nuances, but is very inviting. The palate is beautifully appealing, a lot of fruit sweetness and ripeness, a broad texture but pin sharp finish slicing through the fruit richness. 4g/l residual sugar. Note the price per bottle is shown, but available by the half case only from this supplier. (2016) Planted in the bottom of the vineyard in clay. More vigour but also prone to frost - so 2015 wiped out for example. Felipe says they are considering abandoning this block and moving gewurz to the hillside. Not the most perfumed Gewurtztraminer, but subtle toffee and exotic notes do come through, with just a hint of florality. 20% is barrel fermented. The palate is rich and full, maybe just - just - off-dry, a slightly sticky finish through its extract and hint of sugar. Price shown is per bottle, but available only by the half case. (2016) Ten months in older barrels for this wine which was harvested early. Rather reduced, sulphur aromas with some florality coming through, a hint of chestnut. The aromas do begin to emerge with black cherry. The palate has a dry, quite meaty character, with a firmess to the black fruit. Lovely juiciness comes through. (2016) Fourteen months in French oak, 20% new, from chalk soils. A meatiness and obvious wild yeast earthiness here, and just a touch of reduction again. The fruit comes through very sweetly on the palate, still meaty and warmly earthy, but a touch of vanilla and fine tannins, some fat but lovely acid clarity. Stops just short of being a bit to heavy and full for my Pinot Noir tastes. Price is per bottle, but available only by the half case. (2016) "The most radical wine in our portfolio," says Felipe. It began as a project with just 10 rows of vines, but the first few years were hit or miss, with some greenness. So they have planted new vineyards in the highest part of the vineyard - this is still young vines - and it clearly must be picked early with only 12% alcohol. 16 months in barrels with spontaneous fermentation and only gentle extraction. A touch funky and a touch reduced. Felipe thinks it is still too young. Fine charcoal and peppery notes do come through, with a touch of leather and bacon fat, a touch of cedar/graphite and certainly a nose full of aromas. The palate has lots of dry, earthy, dry red fruit character, refined and savoury with good length. Available only by the half case.